Events in Egypt this week prompt many responses. Here are some thirteen (complementing my article suggesting that Morsi was removed from power too soon to discredit Islamism as much as he should have). 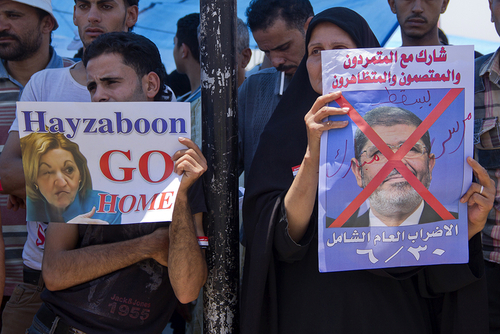 Was Morsi the democratically elected president of Egypt? Every press account affirms he was but that is wrong. I co-authored three articles on this topic with Cynthia Farahat, looking at the first round of parliamentary elections ("Egypt's Sham Election"), the second round ("Don't Ignore Electoral Fraud in Egypt"), and the presidential elections ("Egypt's Real Ruler: Mohamed Tantawi"). In them, we documented the extensive manipulation of the 2011-12 elections, which we saw as "a ploy by the ruling military leadership to remain in power." I remain puzzled and frustrated why these elections, with their don't-pass-the-laugh-test results, continue to be portrayed as legitimately democratic. That they were not skewers the whole business about the military overthrowing a legitimate leader. 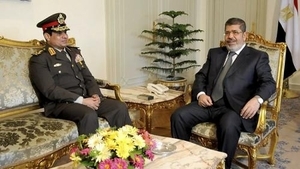 Morsi was never in command: Obviously, he did not control the military, but he also did not control the police, the intelligence services, the judiciary, or even the Presidential Guard assigned to protect him. As one report from Cairo put it, "in a sign of how little Mr. Morsi ever managed to control the Mubarak bureaucracy he took over, the officers of the Presidential Guard … burst into celebration, waving flags from the roof of the palace." In other words, Morsi always sat in his office at the sufferance of the deep state, the very agencies that brokered his "election" in June 2012. Morsi sat on the right side of Sisi, denoting his authority, but we now know who really ruled. There are only two powers, the military and the Islamists: This sad truth has been confirmed repeatedly in the past 2½ years of Arabic-speaking upheaval, and it has been confirmed again now in Egypt. The liberals, seculars, and leftists do not count when the chips are down. Their great challenge is to become politically relevant. 1952, 2011, 2013: The Egyptian military has now thrice in modern times overthrown existing leaders – a king, a former air force general, and a Muslim Brotherhood figure. No other institution in Egypt enjoys its power. In both 2011 and now, the street demonstrators congratulated themselves on deposing the president, but had the military sided with those presidents and not the demonstrators, the former would still be in office. The Safi line of consumer products, one of the Egyptian military's profit centers. Military, Inc.: The military officer corps has a vast and unhealthy control over the country's economy. This interest transcends all else; officers may disagree on other matters, but they concur on the need to pass these privileges intact to their children. Conversely, this materialism means that they will make a deal with anyone who guarantees its privileges, as Morsi did (adding new benefits) a year ago. Ruling from behind the scenes: The 1½ years of direct military rule by Mohamed al-Tantawi and the Supreme Council of the Armed Forces (SCAF) from February 2011 to August 2012 went badly; this presumably explains why Gen. Abdul-Fattah al-Sisi immediately handed the government over to a civilian. Coups d'état have changed: On the evening of July 22, 1952, Col. Gamal Abdul Nasser told Anwar el-Sadat to come to Cairo from Sinai. But Sadat took in a movie with his family and nearly missed the overthrow of the monarchy. This anecdote points to two huge changes: First, the overthrows are now part of a national catharsis, as opposed to the obscure and furtive effort back then. Second, it's now the top military figures who remove the head of state and not hot-headed junior officers. Put differently, Egypt in 2011 entered the more sophisticated arena of the Turkish-style coup d'état, three out of four of which were carried out by heads of the military, not lesser officers. The military's fascism: Hillel Frisch notes that Sisi's reference to "the will of the people," when the people are clearly very divided, points to his and SCAF's inherently dictatorial vision. True, and there's nothing new here; military men have since 1952 ruled Egypt with this sort of anti-democratic pomposity. Analogy to Algeria: The Algerian army's intervened in the political process in 1992, just as Islamists there appeared to be on course to winning elections; this offers a comparison to the current situation in Egypt and raises the prospect of years of civil insurrection. But the analogy is not useful for Algeria experienced nothing like the mass opposition to Muslim Brotherhood rule in Egypt. It would be surprising if the Egyptian Islamists resorted to violence after their earlier experiences with this tactic and after seeing the vast numbers of their engaged opponents. Is Sisi in league with the Salafis? It was striking that Sisi invited Galal Morra as one of the select group attending his declaration that Morsi had been removed from office, and all the more striking so because Sisi's plan of action corresponds to the Salafis' own ideas. In particular, he neither appointed a leftist like Mohamed ElBaradei as interim head of government nor did he scrap the existing, Islamist constitution , but only suspended it. Adli Mansour a mere figurehead? That's what the smart money is saying. But they said the same about Anwar el-Sadat after Gamal Abdul Nasser's sudden death in 1970, only to be proven wrong. Mansour could well be transient but it's too soon to know, especially given his near anonymity. Anne W. Patterson, "hayzaboon": The U.S. ambassador to Egypt has been a disgrace, siding with the Muslim Brotherhood. Being the object of loathing on the streets of Cairo and called "old hag" has been her not undeserved reward for this betrayal of American principles. Morsi and Patterson, reviled together. Will Saudi Arabia fund Egypt? David P. Goldman notes the Saudi monarchy's fear of the Muslim Brotherhood as a republican rival to its power and its huge relief at Morsi's expulsion. He raises the prospect that Riyadh, with reserves of $630 billion, could without much of a stretch provide the $10 billion or so needed annually to keep Egyptians from starving. This is probably the only solution in sight for Egypt's hungry population. But will the gerontocracy open its purse?